Two players with blocking pads are at the mid-posts, defender X5 in the lane faces coach at the top of the key, who takes a one-dribble pull-up left or right, the defender hits the opposite pad and rebounds, go 5 times. Don't just hit and run, the ball bounces over your head, you're trying to create space so you can step and rebound the ball with two hands above the rim (let the ball hit the rim, then go get it). - 3 on 3, three in a row to get out. 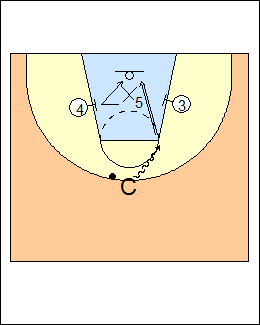 See Rebounding - Weakside, 2 on 2 low post box-out.